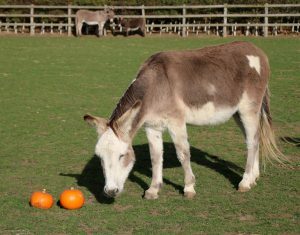 Domino is feeling very well at the minute and has a new friend in fellow donkey, Rico. Domino is a lot older than Rico but that isn’t stopping him running around and playing with him during the day when they are out in the field together. Domino is very caring and conscious to not leave his best friend Nero out of the antics; however, Nero is more than happy to sit back and watch the fun instead of getting involved. Domino and Nero have been great friends to Rico as he has needed a little support this month. Although the warmer weather is on its way, Nero is still a little cool at night so he and Domino come into the stable to stay warm. Domino doesn’t see this as an issue and is always waiting to come in on an evening. 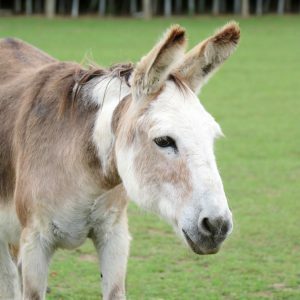 Domino has continued with his spell of good behaviour, when he had his check up by our farrier this month and showed the other donkey’s how to do it. He will of course continue to be assessed to make sure his seedy toe doesn’t get any worse. He has had to send a little bit of time indoors, this month with his friend Nero while they recovered from a bout of colic. Although he is happy to be outside again during the daytime. Domino has received a microchip this month due to a change in legislation that means all equines should be microchipped. He was a very good boy and was very well behaved for the vet. 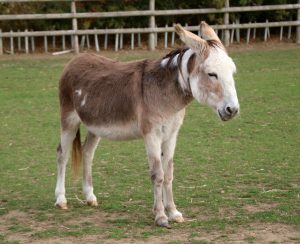 He has also realised he is one very special donkey with very dedicated visitors who came along despite bad weather to wish him and his friends a Happy Christmas! Although he wasn’t as enthusiastic to come over to the fence to say hello. He is enjoying coming into the stable at night and is always waiting at the gate when it is time to come in. Domino has noticed the change in the weather this month and it’s certainly getting colder and wetter! He and some of his friends have moved to the woodchip pad to protect their feet from the mud and hopefully from seedy toe. He has been very well behaved for his feet checks from staff and has also lost a little bit of weight. This is not a bad thing with Christmas just around the corner! Domino is known as ‘The Local Weatherman’ as he is always the first one to head for the shelter if there is so much as a chance of rainy weather or the temperature becoming a little cooler. This is a handy piece of information to have if you are visiting and see Domino, as you know when to make a run for the Feedroom Café to warm up and stay dry! Domino has not been short of attention this month with the half term spook walk going right by his field. He has met a lot of new friendly faces and although he can be quite reluctant to come to the fence for a cuddle, he appreciates the attention all the same. He also received three bags of treats which he has shared with his friends. 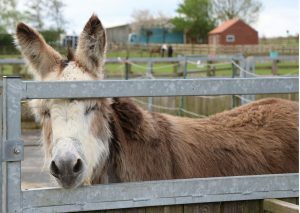 Domino was the star of the show when a group visited this month. 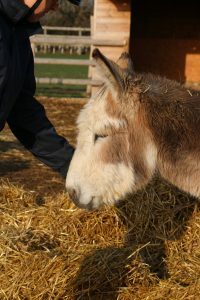 The group were on an organised trip and were able to groom Domino. He was impeccably behaved and a credit to the charity. 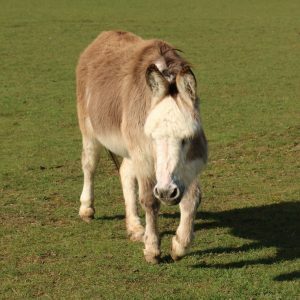 Domino has had a poo sample taken this month to ensure he will receive the correct worming programme. Domino has proved his sixth sense this month when it comes to the weather by retreating to the shelter just minutes before the rain arrives, every time he has it right! He has also enjoyed a lovely groom from staff which has made him feel extra special and he has liked showing off his beautiful coat to visitors throughout the summer holidays. He and the rest of the boy donkeys are back in the field opposite the girls, which makes for a very noisy morning when they are awaiting their breakfast. 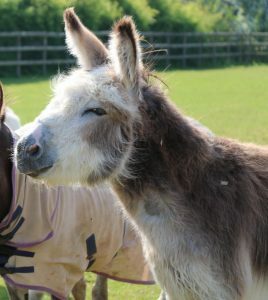 It is still very warm for poor Domino and his friends as the heatwave continues this month! He is often now seen in the shade of the shelters keeping cool with good friend Nero who also isn’t that keen on sunbathing. Domino was very pleased to see his field mates, Apache and Bluey, arrive home from the vets. So much so they brayed across the Visitor Centre as soon as they saw them coming! 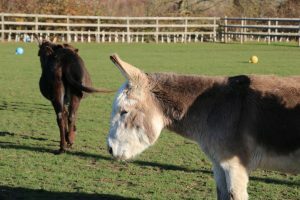 Domino can now take a well-deserved rest from being ‘parent’ of the group and hand the reins back over to Bluey now he is feeling better. As Nero’s best friend, Domino has been accompanying him to the barn during the day to stay cool in the hot weather, Domino has also not enjoyed the high temperatures but did enjoy his daily baths to keep him cool. 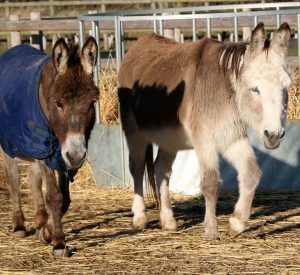 Their herd has also been missing two of the group, as Bluey and Apache had a couple of nights at the vets so Domino has taken on the parent role and has looked after the rest of the donkeys while they are away. 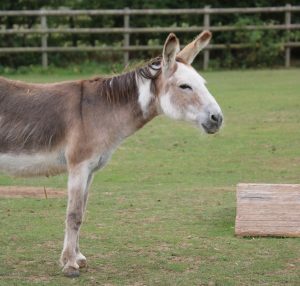 Domino has been having a good pamper this month by having a few baths that will keep him cool in the sunshine. The baths have also helped to get rid of his winter coat too. Domino has had his yearly dental visit where the dentist was very pleased with his teeth and he behaved like an angel! 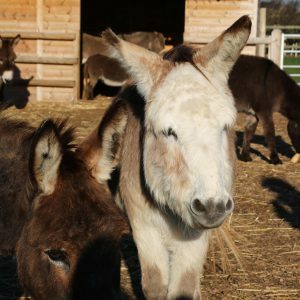 Domino is the winner of the ‘Noisiest Donkey on the Yard’ Award and likes to make sure everyone can hear him, especially at feeding time! 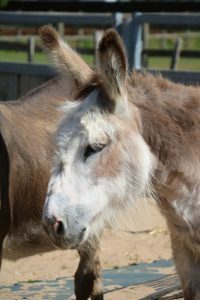 Now the weather has improved, he is enjoying his spring time bath and groom along with the other donkeys to keep him cool over the summer. Domino hasn’t been feeling himself lately and has been struggling with Laminitis. He is responding well to his treatment and improving each day. He is also enjoying having extra cuddles and attention from the staff who are looking after him and of course having Nero by his side.